Sometimes interviews come out of nowhere, such was the case of this particular one. 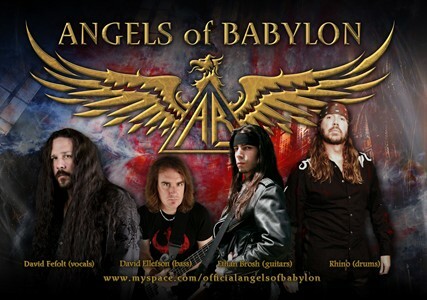 I had recently done a review of Angels Of Babylon’s debut CD Kingdom Of Evil, an album that is so great that I have it listed as a contender for album of the year. After that I received an email from singer David Fefolt thanking me for listening and for the favorable review. He asked if I was interested in an interview and I accepted. 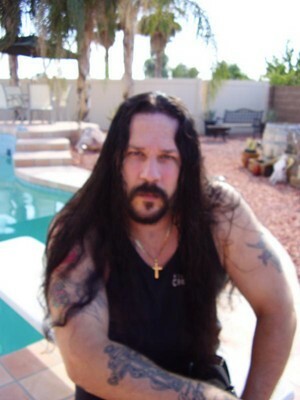 I asked about Angels Of Babylon and past projects that he has been involved in, and by coincidence David revealed that he was working on a band with Wolf Hoffman who I interviewed only a couple of weeks back. Sleaze Roxx: Let me be honest here. I have shied away from bands that David Ellefson has been a part of, the reason being is that a number of groups he has been involved with just didn’t cut it in my opinion — I felt bad for the guy. So when I was given the opportunity to listen to Kingdom Of Fear I proceeded with caution. David Fefolt: To be honest I felt the same. I was a huge Megadeth fan from back in the day, I’ve listened to F5 and a couple of the other bands. I had high hopes, but nothing really stood out. You could listen to five songs and you couldn’t really tell if it was a different song from one to the next. This was before I met the guy. I thought to myself, ‘well I guess that’s it for him, since he’s not in Megadeth anymore’. When Rhino and I started to get the music together for this album Dave listened to it and wanted to be a part of it. I was excited but surprised, because this wasn’t thrash or heavy like some of the stuff that he has done in the past. He really went crazy over this band. I thought that it could be a little bit too melodic for him, but he loved it. He’s still part of the band, though he’s back in Megadeth. Sleaze Roxx: I wanted ask you about that. Your album was released abroad in January of 2010 and Dave reunited with Dave Mustaine in Megadeth around that time. David Fefolt: It was weird because he got back with Megadeth at the exact same time as we released the album. It was literally days after the release of the record that he reunited with Megadeth. All I could think at that time was, ‘man, what horrible luck for me’. In a way that created a little bit of a buzz because people began asking him about Angels Of Babylon. Also a lot of people had written the guy off, so maybe we wouldn’t have gotten much attention had he not gone back to Megadeth. Like I said, he wants to continue to be in this band, it’s just a little hard right now because he’s touring with Megadeth. He’s made it clear that he’d like us to use a fill-in bass player if we have any scheduled shows until he becomes available next year. Sleaze Roxx: So it’s safe to assume that Rhino and yourself wrote the songs that appear on Kingdom Of Evil? David Fefolt: Right, Rhino wrote all the music and did the arrangements and I wrote 99% of the lyrics. Dave was busy with the various other things that he had going on, this was before his return to Megadeth. Ethan Brosh was busy on the road playing guitar with Eddie Money and then with Pat Travers. So Rhino and I resigned ourselves to the fact that we’d be writing the songs and the other guys would add their parts as time permitted. All in all I think it turned out pretty well. Sleaze Roxx: You mentioned how Dave got involved, but how did you guys wind up with Ethan Brosh? David Fefolt: That’s one of the beauties of MySpace (laughs). Rhino discovered his page and liked what he heard and then passed it along to me to hear what I thought. I thought the guy was great. Rhino decided to send him a track to see if he liked it… also, if he liked the track to throw a solo over it so we could hear what he sounds like in the band. He loved the track and he sent it back with a couple of solos on it. He was in the band from there forward. Sleaze Roxx: This album wasn’t recorded in the old school traditional way. David Fefolt: That’s right, in the old days you’d go in as a band with this kind of gang mentality and record. In this day and age you can be thousands of miles away and piece the songs together. Like you pointed out in the review, a lot of times you don’t capture the feel because everyone isn’t together, creating this all in one room and feeding off of one another. The internet has changed music so much. Sleaze Roxx: You’re right. There are countless examples of how the method you guys employed to put this album together didn’t work. Thinking back, I think the main reason it didn’t work was because the songs weren’t there to begin with. David Fefolt: Right, that does play a big part in making a record period. I’m old school, I like sitting in the same place with the rest of the band and capturing the moment. I do miss those days, but with the record industry being what it is today it’s hard. They don’t sell records anymore, there aren’t any big deals anymore, they don’t front you money to get into the studio to record an album. In the old days you’d get $100,000.00 to record an album and you’d came back with a huge sounding record and turn it into the label. These days you sign a deal with a label and they expect for you to have an album on hand. Labels just don’t want to invest any money because of downloads, they kill record sales. If you look on Blabbermouth you see first week’s sales, the average I have seen is about 6,000 to 7,000 albums. Sleaze Roxx: That’s right. In fact I was surprised that the new Megadeth live CD sold around 2,000 copies in its first week, that’s incredible. David Fefolt: I saw that. It just amazes me. Unless you are a Megadeth or a Metallica… or any one of these bands that are still going strong for the past 20-30 years I don’t know how anyone makes a living anymore. It’s frustrating that the week leading to the release of your album, or the day of release, it’s already available for download on like 1,000 sites. How do you combat that? I have no idea. Your album might have a million downloads but you’ll never get paid for them because they are illegal. The only way of making money these days is playing live and selling t-shirts. So illegal downloading is one of the downsides of the internet, but there are advantages — like you can have a guy in England and another in the United States and they can send stuff back and forth and record a song or an album together and cut back on costs. Sleaze Roxx: One thing that will never change is the live performance piece. What do you guys have lined up in the way of live shows? David Fefolt: The first thing that we’ve booked and confirmed is a trip to South America, that will take place in January of 2011. We are scheduled to be down there for about a month, so that will be great exposure for the band. Living in the United States and playing in a metal band, it’s tough to play anywhere other than a small bar. I don’t want to go back to playing bars every night, I did that years ago, I don’t feel like doing that again — it’s not fun. Traditional heavy metal in the United States just hasn’t recovered from the grunge takeover. In Europe its totally different story, maybe I should more there? I’m sure I’d work more if I lived there. Getting back to the record sales thing, I find it hard to believe that in a country like the United States where we have 300 plus million people and only 7,000 people buy a metal record on release date. I understand there are thousands of illegal downloads, but there aren’t more than 7,000 people who bought the album? I love CD’s, I still buy them. I buy MP3’s from Amazon.com if I’m going on a road trip and need the music now, but I think there’s nothing like having the physical thing — you get the artwork, the liners and the music. I order the physical thing, I love having it in my collection. I’m astonished that there are only 7,000 other metal fans that feel the same way. You have to be kidding. I just bought the new Accept album, I got it yesterday, and what a great CD! I’m sure if you look up the number for first week sales they sold 7,000 copies, that seems to be the magic number these days. I just don’t get it. Sleaze Roxx: I’m with you, I prefer having the physical copy. I couldn’t very well ask you to sign my iPod now could I? I guess I could, but that would be ridiculous. David Fefolt: Exactly. I’m old fashioned I guess. I hated it when they moved to CD because I used to love holding an LP in my hands and looking at the artwork. If someone could figure out a way to get paid for all of those illegal downloads then you’d be a millionaire, because those record labels would pay you for that idea. Sleaze Roxx: Going back a few years, you were in the band Hawk with guitarist Doug Marks? David Fefolt: Right, I sang on the Hawk record in 1986 I think. Sleaze Roxx: I remember Doug Marks as the guy in the back of all of the metal mags pitching his Metal Method audio cassettes. David Fefolt: (laughs) He still does, but they’re DVD’s now. You’re right, when he started it was cassettes… that how far back he goes. Hawk was a good time. I was living in Pittsburgh, it was about 1984, and I had this band called Valhalla. The guitar player and I were sitting around one day, I forget if it was Hit Parader, Circus or Creem Magazine, but he had a copy that had an ad that said that Doug Marks was looking for a singer. My guitarist encouraged me to send a tape to Doug to see if I would get selected. I was like, ‘yeah right, like that’s going to happen’. He kept telling me to do it, he gave me the ad I took it home and sat on it for a couple of weeks. I eventually put together a cassette of three songs that I did with the band and submitted it and didn’t think about it again. If you can believe this, a year later I had moved to Phoenix and I get this phone call — it was Doug Marks. He tried to call the number I included with the cassette and the number wasn’t in service so he looked in the phone book and tracked down a relative of mine and they gave him my new number. It was strange because I hadn’t thought about it until he called. I met with Doug and we made an audition tape and the next day he wanted to get started on a record. It was fun, it was right at the height of the big metal hair days. Ratt, Motley Crue and all of those bands were at the peak of their careers hanging out at The Rainbow and playing all the clubs in L.A. It was such a blast. Sleaze Roxx: You had Matt Sorum playing drums pre-Cult on the Hawk record. David Fefolt: He played on the album. Doug had a band before he got me in. He had Lonnie Vincent from The BulletBoys on bass, Scott Travis of Judas Priest on drums and he had another guy in the band who I can’t recall right now. To make a long story short, those guys partied too much and the band just fell apart. He then got me and when we were going into the studio we needed a drummer. Matt Sorum at that time was a session drummer and not well known. We recorded the Hawk album at Pasha Sound Studios. Sleaze Roxx: I have a confession to make. I blew through three cassette copies of the Masi Downtown Dreamers record. That was good album, I don’t know what your thoughts are now on it, but how was it working with Alex Masi? You went from this technical guitarist like Doug Marks to a guy that was like the second coming of Yngwie Malmsteen. David Fefolt: Sure, Doug is very detail oriented, he gets everything lined-up up and organized. Alex Masi is the complete opposite of Doug. Ironically I met Alex at Doug’s house, I hadn’t met him before. 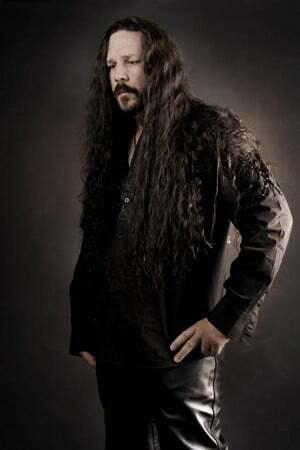 He introduced himself to me and said, “I’m recording an album for Metal Blade Records and I’m looking for someone to sing on it.” I got together with him and had all these musical pieces and he told me that recording would begin in one month. There were no lyrics, just all this music on tape… the stuff on the tape was a bunch of licks, progressions, transitions and you can’t tell what’s a chorus, what’s a verse — it’s just music. Alex said, “we need to write and put all of these (ideas) together in a month so we can start recording.” At that point I thought to myself, “Oh my God, I don’t know if that’s possible!” I started arranging things, trying to make sense out of it all. Alex is like this mad scientist type of guitarist — he’ll play for 20 minutes, record it all, and then give you a copy of what he played and say, “here, see what you can do with this.” We go it together before we went into the studio. I think it could have better, but I do like quite a bit of the stuff on there. I don’t talk to Alex now, but I have read in interviews where he says that Downtown Dreamers is his least favorite album out of all of the stuff that he has done. If you ask me, that’s the album that he got the most recognition for. I mean we were on radio in some areas, we made it onto MTV, we toured behind the album and he did better with that album than anything he’s done since. In the end it didn’t work out because Alex was just so disorganized. I didn’t work in the same scattered way that he did. I just couldn’t take anymore of him giving me tapes with countless ideas and trying to get into his head, then coming back with a songs after working on them for days and him saying, “I don’t really like that.” It was a struggle working like that. Sleaze Roxx: I saw the video clip for “God Promised A Paradise” a few weeks ago when I tuned into VH-1 Classic in the middle of the night. That brought back a lot of memories. David Fefolt: Cool man. Our producer on that album was Howard Benson, he is huge now. He’s worked with Daughtry and all of these bands that have sold millions of albums. Howard was the reason that the Masi album sounds so good. A lot of bands from that era had albums that sounded muddy, which was sad because some of those songs were great. “God Promised A Paradise” to this day I get people come up to me and tell me, “man I love that song.” Apparently some people still dig it. Sleaze Roxx: You made mention of Accept’s Blood Of The Nations album. Up until I heard your album Kingdom Of Fear it was record of the year in my book. Angels Of Babylon have given me a lot of thinking to do, it’s probably going to end in a draw. David Fefolt: I really like the new Accept album. I’ve always been an Accept fan, I love Wolf Hoffmann, he’s a fantastic guitar player. I was in a band with (guitarist) Jorg Fischer who played in Accept. I’ll let you in on something, right before Accept got back together in the last year I was in talks with Wolf Hoffmann about doing a band together. I had no idea what was going on with Accept, I was listening to XM Radio and “Metal Heart” came on. I said to myself, “man Wolf Hoffmann what a great guitar player, I haven’t heard him in years. Why isn’t he playing in band?” I made it my mission to contact him and ask him if he’d like to form a band. Now that might have been stupid and crazy, but I got in touch and he listened to some Angels Of Babylon and he loved it! He thought the songs were great and for a while he wanted to be in Angels Of Babylon. I was shocked, but that wasn’t going to work out… we already have Ethan and we can’t do that to him, he’s in the band. So we were going to write together and form another band. I would sing, Wolf would play guitar, Rhino was going to drum and we’d look for a bass player. For a couple of weeks we were sending stuff to each other back and forth and then I get an email from Wolf letting me know that Accept is getting back together. I was crushed, he has been one of my idols and I was looking forward to writing some music with him. I thought, “you know they tried it before with another singer David Reece and it just didn’t work. You just can’t have Accept without Udo, no way!” When I heard their new singer Mark Tornillo I was convinced. They have captured the classic Accept sound. Mark is just perfect for that band, I just couldn’t believe it! I love the new record. I’m sorry that Wolf and I couldn’t do anything together, but man I love that record. I hope they don’t beat us out for album of the year on your list now (laughs)! Sleaze Roxx: You’re neck and neck man. I have Kingdom Of Evil and Blood Of The Nations at number one! I truly love your record and I’m glad that I got a chance to hear it. Sleaze Roxx: Thanks so much for your time David I really appreciate it. David Fefolt: Thank you for your support and I look forward to talking to you again.